Breakfast Fruit Bruschetta featuring Ozery Bakery's Morning Rounds #Giveaway - Frugal Mom Eh! There is nothing like fresh fruit, something warm and toasted and coffee at breakfast. Muffins smothered in butter, fresh doughnuts still a little bit warm, and who can forget cinnamon buns and don’t forget danishes. All delicious treats but so full of unnecessary calories and fat. I usually stick with oatmeal and half a grapefruit for breakfast to avoid all those calories but that has definitely lead me into a breakfast rut that I want out ! Ozery Bakery is a family-owned bakery that started off with humble beginnings. I was sent a few packages of their low-fat, vegan Morning Rounds & Snacking Rounds to check out. 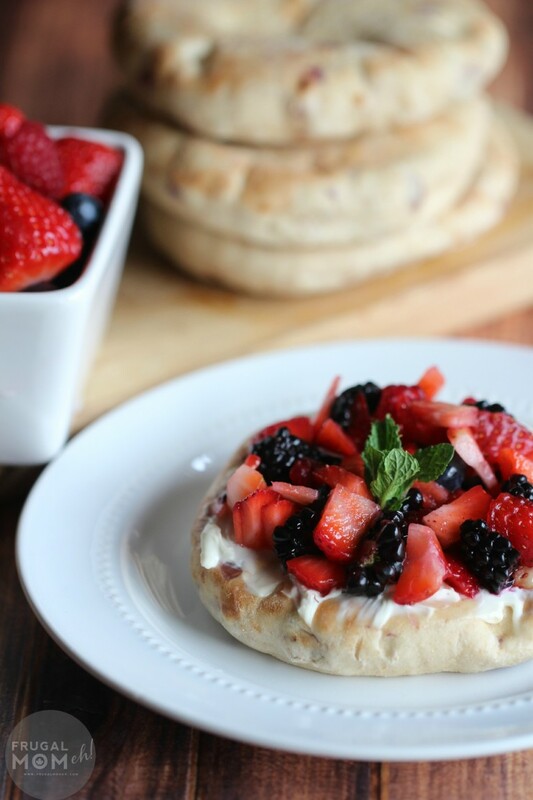 They are fruit and whole grain buns that are amazing as is or toasted with your favourite spread. They easily replace white bread, bagels, and pastries. They are also available in several varieties – Muesli, Apple Cinnamon, Cranberry Orange, and Date & Chia. Ozery’s Rounds are low in fat, free of artificial preservatives and contain lots of beneficial fibre, iron, calcium, Vitamin B, antioxidants, and folic acid. Morning Rounds are crafted with care in small batches, and contain absolutely nothing artificial. The Breakfast rounds and snacking rounds have been a huge hit in our house. These packages lasted no more than 3 days because everyone loved the flavours, and especially the freshness. It’s been an easy way to change up how we start the day and especially how we snack during the day. They also freeze really well so you can get the bakery fresh flavour and softness anytime just by thawing or toasting from frozen! 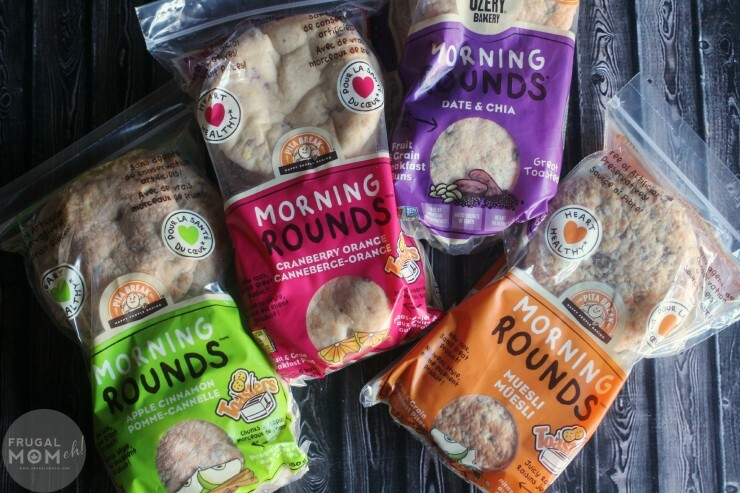 You can get the bakery fresh taste of Ozery’s rounds online or at a store near you. I absolutely cannot get enough of the Apple-Cinnamon nor the Cranberry Orange flavours but that isn’t to say the other flavours didn’t disappear just as quickly. You just can’t beat fresh, healthy and wholesome food! For more information you can visit Ozery Bakery online and follow along on Twitter! 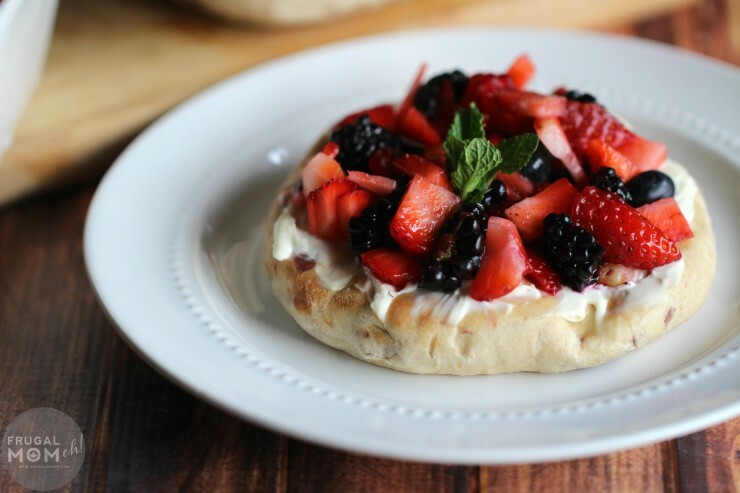 Spread cream cheese as thickly as desired over breakfast round then top with chopped fruit and mint. 1 package Ozery Bakery Breakfast Rounds The Cranberry-Orange was my favourite with this! 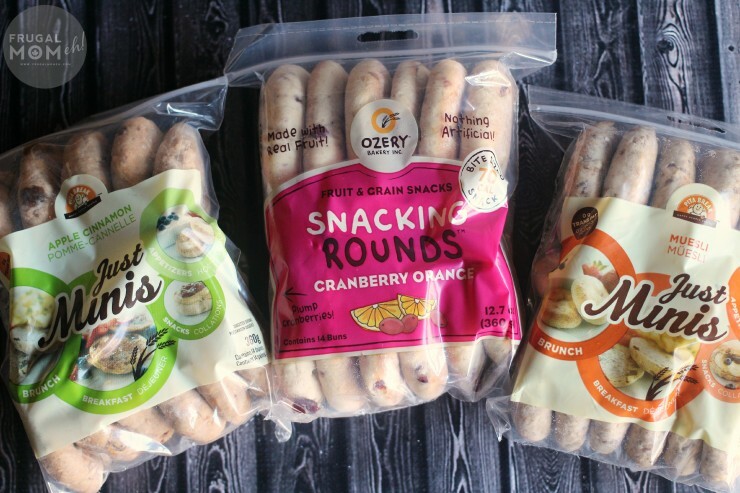 One Frugal Mom Eh reader will win an Ozery Bakery Prize Pack consisting of an assortment of goodies from Ozery Bakery (which will include one of each flavor of Morning Rounds, Snacking Rounds and One Buns). Giveaway is open to residents of the U.S.A. and Canada and closes for entry on March 1st 2015 at 11:59 pm est. See Giveaway Tools form for Entry and T&C. Quite simply with cream cheese. I like them with honey. Nutella and strawberries would be soooo good! I would top them with jam and butter. As a big fan of peanut butter, that’s what I would put on them. I’d top them with Peanut Butter and Bacon! I’d top it with cream cheese and fruit! I would put some soy butter on top. I WOULD TOP IT WITH CREAM CHEESE AND CHERRIES. Toasted with butter would be yummy. I would put some crispy bacon and a nice runny egg on one. Nothing! We buy these all the time. They freeze up great. I just pop them in the toaster and warm them up then eat them plain. I’ve never seen the mini snacking rounds in a store though. Yum. I would top it with strawberry jelly & cream cheese! I would top these with cream cheese and jam! I would top them with avocado slices. Yum! probably top it off with berries and whipped cream! I’d top it with a cranberry goat cheese that I have right now. Heavenly. I would put nutella hazelnut spread on them. I would top them with cream cheese. Cream cheese and jam! Yummmm. I’d top them with cream cheese and fruit! I would put nutella, and strawberries! Mmm I would look forward to that every morning. I would top it with peanut butter and sliced banana. I would top them with a nice poached egg and slices of bacon. Wow butter and jam for me! The cranberry orange sounds so delicious! I would top mine with honey and a few slivered almonds. Apricot jam & Bacon on the side..
I’m pretty plain so I’d top my Ozery Bakery morning rounds with one of my favourites~ Strawberry Jam 🙂 Thanks for a great review and giveaway! I would top it with butter or strawberry jam. I`d top them with cream cheese,yum! I would top mine with peanut butter and banana. I am a sucker for butter and cream cheese so I know I would top them with that. However, I like a nice marmalade on these types of things sometimes so I may indulge that way as well. I would top it with nutella. I’d definitely use Mom’s homemade raspberry jam! Looks like they’d be good with bacon and melted cheese, maybe a tomatoe as well! Strawberry jam and cream cheese. Honey and peanut butter!! Sounds delish. 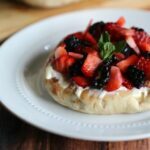 Ricotta cheese, fruit and a drizzle of honey or balsamic reduction. Delicious! I would top these with cream cheese. I would top them with cream cheese.. I would probably use peanut butter or yogurt. I’d like to top it with cream cheese and some delicious apricot preserves. Peaches with a hot peach preserve jam poured on each piece for the summer and mixed frozen berries and warm honey for winter treats. I would top them with strawberries and whipped cream. I’d top them with peanut butter. Probably Nutella or Speculoos from Trader Joes. I would like to put cream cheese on it. I would top them with my favorite combo, a little butter, jam, and a sprinkle of cinnamon sugar. I would put butter on a toasted orange cranbery morning round or a spoon full of peanut butter. I would top them with Nutella or Peanut Butter! I would top it with whipped cream & strawberries. I would probably top them with maple syrup and fresh fruit. I would be adding peanut butter on top. Strawberries and whip cream would be nice! Or nutella :).. Either maple syrup or fresh strawberries! I’d top with peanut butter! I would top with bacon & sharp cheddar cheese, yum! Thanks for the chance to win! hmm… how about some Nutella! I’d top them with apricot jam. I think I’d try some almond butter on these in the morning. I would top with Nutella for the kids..natural peanut butter for me! I put homey on everything so I would top them with it. I would top Ozery Bakery morning rounds with peanut butter. I currently top with peanut butter and jam. Option you gave sounds good though. Will try! I would top them with almond butter and jam. What would you top Ozery Bakery morning rounds with? I would top it with cream cheese and fruit. I would have them for breakfast with some Peach Jam. Thank you for having this giveaway and the chance to win. I would top them with cream cheese, strawberries, and bananas. I would top them with nutella or apple butter! I would top mine with strawberry flavored cream cheese and sliced berries. I’d top them with a fried egg over easy and sauteed mushrooms and onions. I would try out different jams on them. I would top mine with whipped butter and honey. I would top the morning rounds with cream cheese, fresh sliced peaches and just a sprinkle of powdered sugar. I would probably make breakfast fruit pizzas or top with homemade jam. with some cream cheese and some strawberries on it ! I would add cream cheese and ham!! I would so put honey on them! Sooo good! I would top them with raspberry jam.